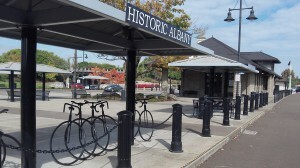 Albany Station is the mid-valley stop on the Union Pacific mainline. A committee of elected officials has decided plans for expanding passenger rail service in the Willamette Valley should make use of the existing Union Pacific mainline, but it also wants to give additional consideration to routing future trains at least partly along Interstate 5. The planning project’s leadership council, which includes Albany Mayor Sharon Konopa and state Rep. Sara Gelser of Corvallis, met in Salem Tuesday and agreed to move forward with an environmental impact study of using the UP mainline, but also to look into how the I-5 routing option would affect the metro area. The panel dropped the idea of a route through Monroe and Corvallis, as well as one that would use parts of the old Oregon Electric line south of Albany. People from Corvallis had lobbied for the route through that city, but Gelser said she could support the panel’s decision. At her request, the group’s report will include language on improving Corvallis connections with Albany and Eugene, perhaps with a future spur line or improved “multimodal” connections. “I think there was broad consensus among the Leadership Council that ridership could be improved with better access to rail from Corvallis, whatever form that access might take,” Gelser said in an email. Of the 7 runs between Eugene & Portland, 4 are by bus and 3 by train. One train is the Coast Starlight, which by its nature, would be usually much more expensive (thus NOT commuter friendly) since it originates in Los Angeles and reservations must be made much more in advance to guarantee a seat. This basically leaves 4 bus and 2 trains for commutes. If a citizen of Albany wants to use Greyhound, they must go to Corvallis. Let the people of Corvallis go to Albany and catch the train! The Linn-Benton Loop bus runs BOTH directions. There’s no need to invest in MILLIONS (or more) dollars, when AMTRAK can run buses at their whim.